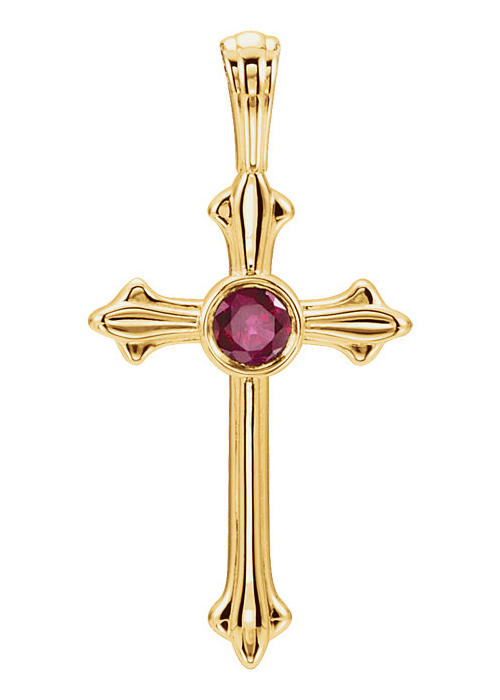 Soft yellow gold and a single ruby gemstone are paired to create a truly beautiful piece of jewelry in Apples of Gold Jewelry's women's fluerie design ruby cross pendant! The cross pendant, which is a fluerie design, starts off wider at the tips and tapers off a bit smaller toward the bezel setting used on the ruby stone. The authentic ruby gemstone, which is a soft, yet stunning red in color, measures 3mm in size and is AA rated. The whole of the pendant measures 1 inch in height by 1/2 inch in width, and will compliment a variety of chains and ensembles! "Ask, and it shall be given you; seek, and ye shall find; knock, and it shall be opened unto you:"(Matthew 7:7). We guarantee our Fluerie Design Ruby Cross Pendant, 14K Gold to be high quality, authentic jewelry, as described above.